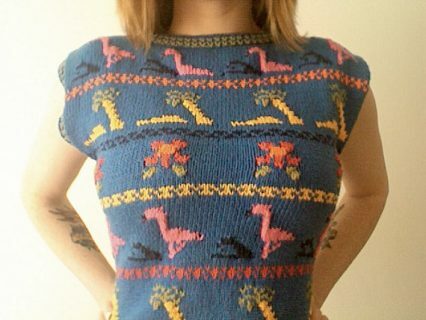 Vintage Womens knitwear takes many forms and goes right back to the fitted forties and up to the baggy 90s. Take a look and see which decade you want to visit, with our versatile first class selection of vintage womens knitwear. Our stock is quite impressive and a piece of knitwear is always a versatile choice for any two piece ensembles. Whether you’re looking for a 1950s sweater girl look, or a smart two piece to match with smart pants a la Ingrid Bergman, we’ve got a great selection here for you to choose. Although knitwear is often associated with fuddy duddy types, or for the older generation, you couldn’t be more wrong. A good quality piece of knitwear can add something to your outfit giving it that final touch. Add a statement necklace or bangle and you’ve got a look going on. Some of our buffalo sweaters have the most exquisite graphics matched by mini shawl collars and a great versatile selection of 80s jumpers in a variety of different colours, patterns and shapes. You could match a thin knit beaded sweater with straight leg black pants for a sophisticated silhouette with soft lines. A cashmere sweater never loses its charms and could be matched perfectly with a short skirt or shorts even and thick tights, finished off with a pair of flat chunky boots or shoes. We have quite an impressive range of 50s style cashmere sweaters in stock at the moment and they’re well worth a browse. We have the ubiquitous Christmas sweater, but with us you’ll get the original ones before they became so popular and some really good quality Scandinavian and Icelandic sweaters too, which can be matched perfectly with a good quality pair of skinny jeans and knee high boots. So take a look around at leisure, either down at our shop on Holloway Road or online where you can browse vintage knitwear for Women in your own time.